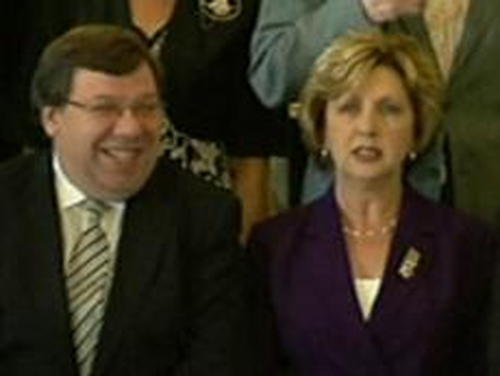 President Mary McAleese has indictated that her decision on whether she will refer two pieces of legislation to the Supreme Court to test their constitutionality will be announced tomorrow. The meeting of the Council of State called by the President ended at around 10pm. The meeting at Áras an Uachtaráin was called by President McAleese to advise her on the Defamation Bill and the Criminal Justice Bill, which require her signature to become law. The President has indicated she will announce her decisions tomorrow morning. The Defamation Bill and the Criminal Justice (Amendment) Bill have both been passed by the houses of the Oireachtas. However, they do not become law unless they are signed by the President. Both bills being considered by the Council of State have attracted controversy. Aspects of the Criminal Justice (Amendment) Bill have been strongly criticised. A provision that will allow the non-jury Special Criminal Court to try cases involving criminal gangs has attracted criticism from the opposition and civil liberties groups. The inclusion of a definition in the Defamation Bill of the crime of blasphemy and provision for its prosecution has also been criticised. It is not clear what aspects of the bills have prompted the President to ask the Council of State's advice on them. While President McAleese has to consult the Council of State, it is her decision alone whether to refer one or both of the Bills to the Supreme Court. The meeting began at 6.30pm at Áras an Uachtaráin.